Belgian. 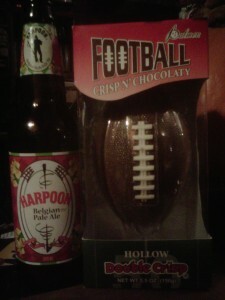 The Steelers play a new flawless half of Steelers football, while my friend Hiromi sips a Harpoon Belgian Pale Ale. Belgian. I know what makes football Steelers football: a blue-collar straight away get the job done attitude understanding that with a little more luck you could win this thing. Steelers. But Belgian? The word is ubiquitously sweeping the craft and near-craft brew scene. And it’s not like a specific flavor; heck, not really even a particular brewing style. But you throw Belgian in front of any beer style and you now got yourself something new and sparkly. Sometimes it brings a note of quality and care, complexity and excitement that throwing the word Steelers in front of football might suggest. In this case, the cloudy citrusness that Harpoon lays over the crispness of a pale is pleasant enough, but I am not sure it power enough to win a Belgian Superbowl.